Oh New York. If it's supposed to be spring, then where is the sunshine and WARM weather? Yesterday's cold temperatures and wind-whipping weather has me looking back on pictures from my L.A. trip last month. One of the highlights of my trip included getting to catch up with my lovely aunt and uncle. They are the nicest people, who helped me schlep my belongings in and out of the dorms every year throughout college. (A con of being an international student is that you end up having to exploit local family members for help). Anyway, we arrived at Little Next Door at 12:30pm on a Saturday and only had to wait 5 minutes or so. Since the restaurant was full, they actually took us to Little Door, the more formal counterpart located adjacent to Little Next Door. 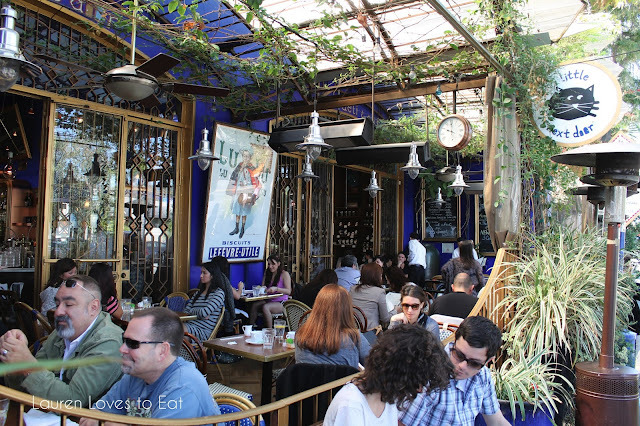 We were seated in a Mediterranean-esque patio area which had beautiful trees all around and red Spanish tiles on the ground. Little Next Door serves local farm-fresh and organic ingredients. The French bistro also has a take-out pastry section, where some say the macarons are even better than those at Bottega Louie. I'll have to try them next time! Outdoor seating at Little Next Door. Escargots de Bourgogne, $11: My uncle proposed sharing an order of escargots, and I realized I hadn't had the dish in over a year. 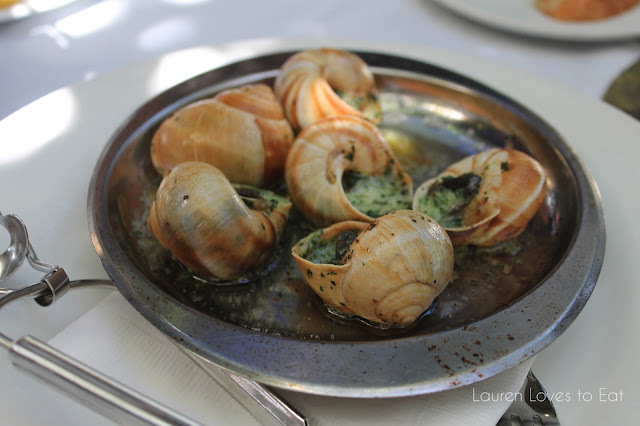 I do love these snails though, and when they arrived, I couldn't help but slurp it up. I mean, garlic parsley butter should never be wasted. I'm quite averse to parsley, but luckily for me, it wasn't the least bit overpowering. Smoked salmon eggs benedict with house salad, $14: This salmon benedict definitely gave my beloved benedict at Balthazar, a run for its money. 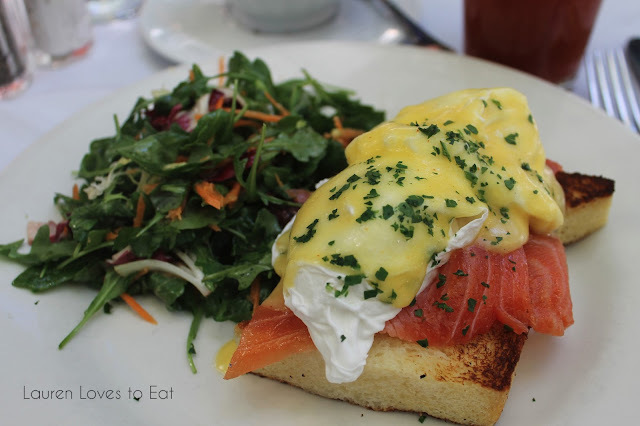 The poached eggs sat atop the freshest pieces of salmon and thick buttered toast. I love when restaurants get creative with the bread for eggs benedicts. It makes it so much more interesting, and in this case, all the more stunning. The combined textures were heavenly, as there's nothing worse than sawing a knife back and forth to cut off a piece of English muffin. Hands down the best bloody mary I've ever had. Crème Brûlée, $6: The sugary crust was fantastic, but the custard inside was so creamy we thought something went wrong. 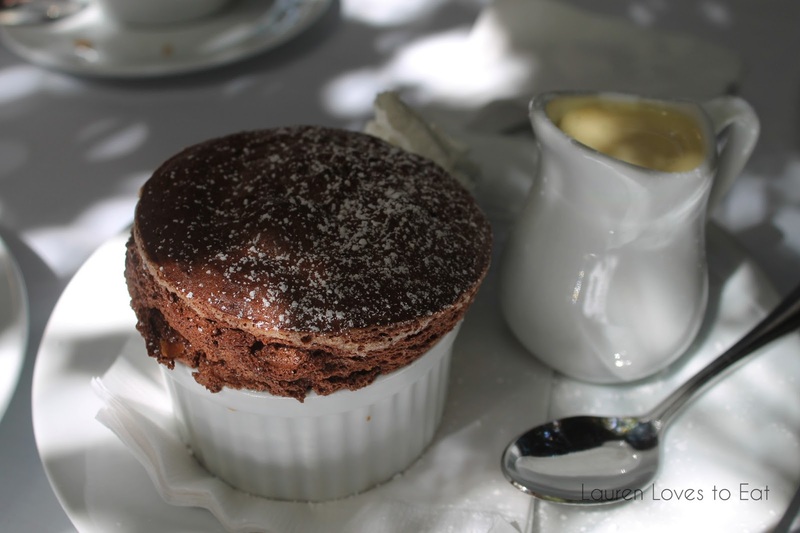 Soufflé au Chocolat with custard and whipped cream: A very well done souffle-- light, airy, not too sweet, and with the freshest whipped cream and custard, we quickly polished this off. OH MY I have never tried escargot! It does look tempting though. 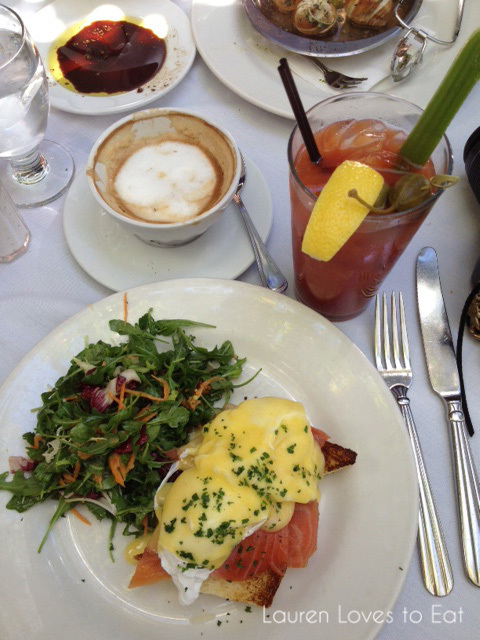 What a lovely brunch! The souffle is making my mouth water! It's still making my mouth water too! Everything looks so good.. 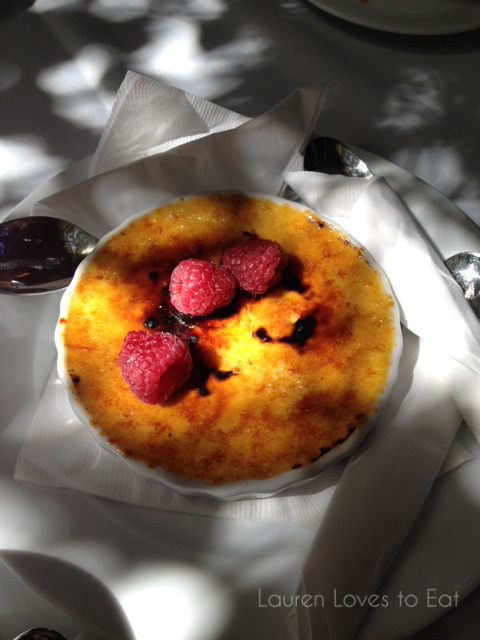 I especially love the ambience and the creme brule and souffle. YUM! I definitely wanna visit this place when I visit LA. Are you gonna stop by LA during your upcoming SF trip? You should! I have yet to go to Little Door, despite this restaurant being minutes away from my house. Looks amazing. I've heard great things!